Thinking about making the switch? You’re not alone. There are at least 300,000 new Android activations every day! 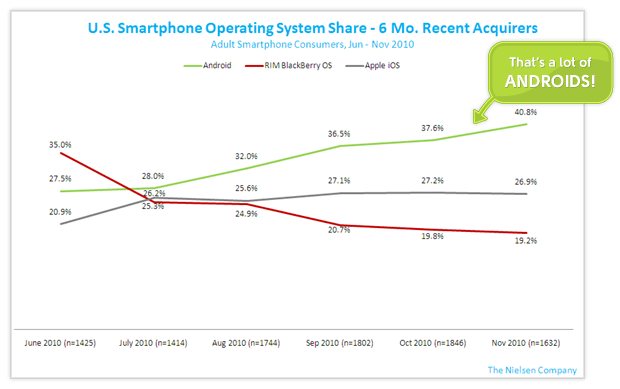 The Nielson Company has some lovely graphs that show Android dwarfing both iPhone and RIM (BlackBerry) in terms of growth in the past 6 months. But many BlackBerry owners are worried to make the switch. Will I get secure email? Will I get the same level of productivity that my BlackBerry gives me? What happens to my beloved keyboard? Is Android really ready for my business data? This entry was posted in News, Tips and Tricks and tagged android, blackberry, migrate, migration, phone switch by Rushang. Bookmark the permalink.